Hei, synttärikortti vauhdikkaalle miehelle! Samalla mallilla tuli tehtyä kukkokortti aikaisemmin, voit katsoa sen tästä. Hi, happy birthday card for a man. I made similar card with another Art Impression stamp here. 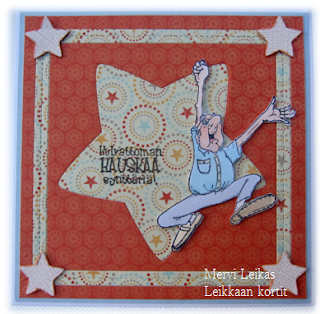 Colouring with Promarkers, stars are Lawn Fawn diecuts. Tämä on hauska ja ihana. This is a card that surely will lift anyone's spirit. So cheerful and joyful and fun! wicked fun card!! Thank you for playing along with us at simon says stamp wednesday challenge! !